Easy-to-use retro compressor. Punch control is excellent. Onboard wet/dry mix. Analogue colouration settings. No manual makeup gain. No 'drive' control for analogue modes. No sidechain features. If you're after instant processing flavour, a vintage compressor emulation is often your best bet. However, these units typically lack flexibility, and it should therefore come as no surprise that the second Waves plug-in to follow the Hybrid ethos is a compressor. According to Waves, Hybrid Compressor (or H-Comp) aims to combine the sound of transformers, transistors and valves with the flexibility of a plug-in - hardly a new concept but one that's certainly worth pursuing. To this end, the retro, easy-access GUI with large VU-style meter also incorporates some up-to-the-minute features. Most obvious is the wet/dry mix control, enabling regular or parallel-style compression. Next up, the analogue-modelled release stage can be set in seconds (3ms to 3s) or BPM, or even synced to the host. As you would expect, the attack stage is pretty flexible (0.5ms to 100ms), but more unusual is the Punch control and analogue emulation circuit offering four colours, too (more on these later). The compression ratio goes up to 50:1, plus there's an optional peak limiter. At the output, you'll also find a trim option (+/-18dB) - however, the gain makeup is handled automatically, which can be frustrating. H-Comp has a few headline-grabbing features, which we worked through, encountering further neat touches along the way. First up, the large meter switches scale depending on whether you're using it for input/output or gain reduction. Plus, you'll also find a useful yellow and red LED peak indicator in the corner. Most usefully, in gain reduction mode, it takes into account the output mix blend, so as you move towards a dry mix, less reduction is shown. Now we come to the impressive Punch option, which enables you to preserve a sound's initial transient, even when using very fast attack times. This works extremely well, but we found that it's influenced by the release times, so easing this back achieves the best results. On the subject of release times, syncing these to the host tempo is an interesting idea, and in this mode, the release knob labelling switches to beat multiples. In practice, because the onset of the release stage is dictated by the signal itself, it works best with very accurately timed or programmed sounds. Even so, it's a clever idea that can help you quickly dial in the settings. H-Comp offers four analogue-inspired colouration modes, so we decided to run a few tests to determine exactly what each one does. First up, the process operates on both the wet and dry signals, and each mode has a very distinctive sonic signature, typically adding low-level distortion to a specific part of the frequency spectrum. Mode 4 is fizzy-sounding, very reminiscent of a driven transistor circuit; while Mode 3 thickens things up, just as an audio transformer would do. And intriguingly, we did notice some differences between the corresponding modes in H-Comp and its sister plug-in H-Delay. All told, the effect is useful, if a little subtle, although with no individual drive control, the colouration is dependent on the incoming signal's level, which is frustrating. The analogue colouration options are a nice touch but not the defining feature of H-Comp, as that honour goes to the excellent Punch control. However, we're a little surprised that H-Comp doesn't have sidechain options or a manual gain makeup setting. 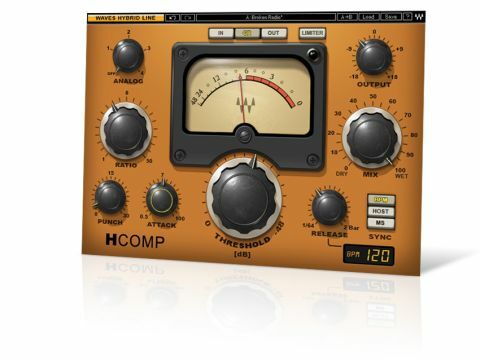 All in all, although H-Comp is impressive sonically, it would be good to see more of the features we've come to expect as standard on a compressor, to complement the more innovative stuff. Electric bass: start setting up a basic compression setting, wind in the punch setting then increase the release to compensate. Finally, spin through the various analogue colouration settings. Piano: set up basic piano compression then adjust punch setting, increase compression then blend between the wet and dry signal, bypass to compare. Kick: compress with fast attack and release, gradually wind in punch setting to regain transient, lengthen release time. Snare: compress with fast attack and release, gradually wind in punch setting to regain transient, lengthen release time.